Hal: What are we trying to prove? Who are we trying to impress? Why am I always looking for answers? 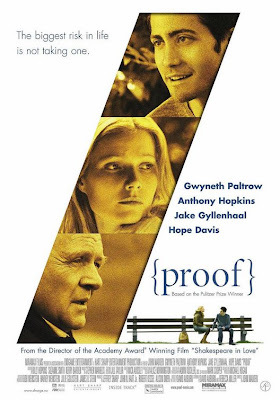 PROOF answers all three of these questions in its first thirty seconds as Catharine (Gwyneth Paltrow) stares blankly at the television, her 27th birthday having just begun. She flips through channel after meaningless channel, settles on nothing and turns to look directly into the camera. Her eyes staring directly at me say, “Nothing, no one and it doesn’t matter.” Of course she’s disastrously unhappy but when did that stop anyone from pretending like they knew all the answers? When the sun rises, she will celebrate both her birthday and the burial of her father (played by Anthony Hopkins), a mathematical genius who drastically changed his field three times before losing his mind. Before the day is out, her sister (Hope Davis) will fly in almost solely to push her further into her hole and she will take a chance on life by allowing a young man (Jake Gyllenhaal) to hold her through all of the crazy mess. The events of the day will give her the courage to share her own mathematical findings, her own proof. Only now she’s actually got something to prove, because it isn’t clear that she is this proof’s genuine author. A mathematical proof, one that checks out, shows that there is order in the world, that there are definitive answers. If Catharine wrote it, than she’s got plenty to prove. And whom does she need to prove this to? Her sister who spends all of her time completing mundane tasks from her meticulous “to-do” list to show that she is functional, structured, successful? Her boyfriend who’s got to get Catharine’s proof checked by the guys at the math department because he obviously doesn’t believe that girls can do math? To her father who was thrilled his daughter’s interests followed his own but only really wanted her to work along side him? And what of herself? If she proves that she wrote this proof, that she has the talent, the ability, the genius that may very well surpass her father’s, how long will it be until she begins to lose her mind? And does she want to know the answer to that last question? Catharine ponders aloud that sometimes everything makes sense in her head and other times, it all seems crazy. Perhaps we don’t always need proof to say which of these realities is the true reality. Perhaps a little blind faith would do us all some good.